Not be provided in the Japanese market. The VF-MB1 has been minimized width size in comparison with conventional model. In addition, side-by-side installation can save space in control cabinet. For 240V-0.2kW to 0.75kW and 500V-0.4kW to 1.5kW models are .. tted to 45mm slim design. And also, 240V-1.5kW to 2.2kW and 500V-2.2kW to 4.0kW models can be .. tted to 60mm. The VF-MB1 can be mounted by Flat Mounting and front block can be attached 90 degree by using additional mount bracket (*2). The space can be minimized with various installation (*1). *1: Current reduction is required if VF-MB1 is installed into less ventilation spaces such as narrow space and side-by-side installation. *2: The model whose front block is attached 90 degree is modified with additional mount bracket in factory. Please request 90 degree type with order, if it is required. Setting dial, 4 keys, and 4 small LEDs with Green 7 segments LEDs can be easy to set parameters and operations. - RS485 (Modbus® RTU) Baud rate 38.4 kbps max. - CANopen®: Baud rate 1.0Mbps max. The VF-MB1 can be used for the constant torque and variable torque applications by dual rating operation. 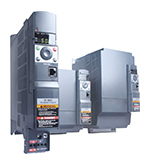 For example, if variable torque application (fan and pump) require 15kW drives, it can be operated by 11kW rated of VF-MB1. The VF-MB1 controls not only 3-phase induction motors (Standard, High ef.. ciency motor) but also Interior Permanent Magnetic Motor (IPM) and Surface Permanent Magnetic Motor (SPM) for high ef.. ciency, high torque, energy saving, downsizing and lightening.